during practice for the NASCAR Gander Outdoor Truck Series NextEra Energy 250 at Daytona International Speedway on February 14, 2019 in Daytona Beach, Florida. On Wednesday, NASCAR announced the indefinite suspension of Jeffrey W. Merritt for violation of section 2.11.1 of its 2019 rule book. “Any NASCAR member charged with any violation of the law (misdemeanor and/or felony) shall notify NASCAR prior to the next scheduled event or within 72 hours of being so charged, whichever is earlier,” states aforementioned section of NASCAR’s rule book. Details of Merritt’s charge(s) were not disclosed. Merrick was most recently listed as a mechanic on the No. 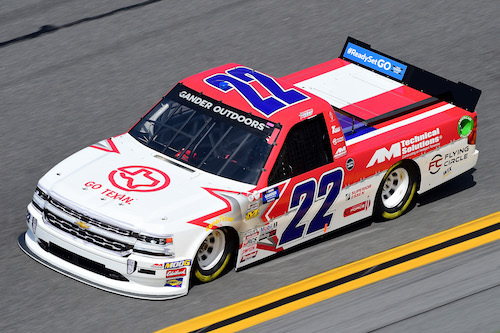 22 AM Racing team in the NASCAR Gander Outdoors Truck Series. Austin Wayne Self was the driver of the No. 22 truck in the first three races of the 2019 Truck Series season, but Monster Energy NASCAR Cup Series regular Darrell Wallace Jr. is slated to drive the truck in Saturday’s race at Martinsville (Va.) Speedway. The Truck Series didn’t race the last two weekends. The series was last in action at Las Vegas Motor Speedway on March 1.